KATHMANDU, Sep 08: Massive cleanliness drive was carried out in the outer area of Pashupatinath Temple, the famous Hindu shrine. Temple infrastructure including stones carvings in front of the temple main entrance was cleaned in joint coordination between the Pashupati Area Development Trust ( PADT), Bagmati Cleanup Mega Campaign and Khem's Cleaning. Likewise, water stone spouts, the place for lighting up lakhbatti and stones placed on the yard of the western main gate were cleaned and daubed. The cleanliness campaign was conducted during Thursday's night that went till Friday's wee hours (from 8:00 pm to 2:00 am). 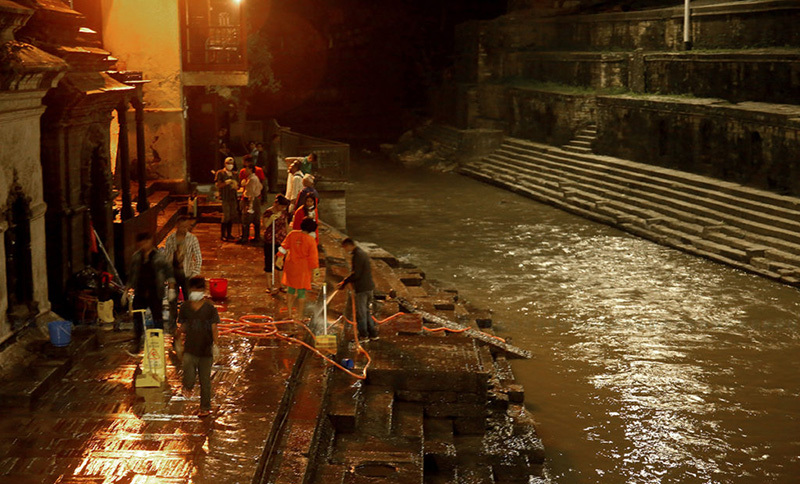 The cleanliness drive was held in night for the convenience of devotees, according to the Bagmati Cleanup Campaign's Spokesperson Umesh Bohora. People from various walks of life participated in the drive. The campaign also has a plan to carry out the cleanliness of the temple's interior part after forging an agreement with the PADT.